The Green Party says it supports the newly introduced monthly national sanitation day under which citizens will be required to dedicate three hours of the last Saturday of each month to clean up the environment. However, the Green Party says the programme which has been dubbed as the “National Day of Cleaning” is likely to flop due to lack of wide consultation on the part of Government. The party has urged Government to rethink the implementation strategy of the programme. “As the Green Party, we support the National Day of Cleaning because this programme speaks to our Vision Green 2030. Our mission as the Greens is to develop and implement policies, laws and strategies which guarantee sustainable management of our natural resources in order to meet basic human needs unconditionally, and to ensure that present and future generations have full opportunities for personal and collective development,” says party president Peter Sinkamba. “The programme speaks to ecological sustainability which is one of the green agenda strategies. Sustainability is really the heart of Green Party thinking. A sustainable nation is one that considers the welfare of its descendants for at least seven generations. We can only achieve that if we are wise stewards of the earth, which includes cleaning and greening our environment all the time. “However, to achieve this, we need to secure three pillars. First of all, we must put in place realistic regulations and strategies. Secondly, there must be realistic and sustainable economic resources set aside to drive the green agenda. Thirdly, the majority of stakeholders must buy into the programme. It appears to us, as the Green Party that the three pillars have not be adequately taken into consideration, and for that reason, this programme is likely to flop,” Mr. Sinkamba said. He said in terms of the first pillar, either a voluntary or regulated lock-down strategy must be employed and added that either of the two strategies has pros and cons. He said Government should undertake an impact analysis of the policy or strategy before launching the strategy and enacting laws to that effect. “I can’t remember hearing of a policy or strategy analysis on national sanitation day,” he said. With regard to the economic resources, a nation-wide monthly strategy like the National Sanitation Day requires a budgetary allocation. Mr. Sinkamba said there is no budget allocation for such a programme in the 2018 budget. “Honorable Mutati never mentioned a programme like this in his 2018 budget speech. So if this programme has to run, it will entail shifting resources from budgeted lines to this project. Such a move would run afoul with the Financial Management Act,” Mr. Sinkamba said. On the consultations, he said that Government did not consult widely. For this reason, the Local Government Minister Vincent Mwale announced that the SDA Church will be exempted from the programme. He said such an exemption would not auger well with other churches and stakeholders as it would be discriminatory, and therefore unconstitutional. “No person in Zambia should be discriminated against. If church members of one church are exempted from compulsory labour and others compelled to labour, that moves runs afoul with the constitutional imperatives and therefore illegal,” he added. Mr Chamba man we know that daga smokers are naturally dirty by you should know that its from 08:00hrs to 11:00hrs (4 hours) only in a month.The idea is to get everyone involved on a full throttle so that our mindset can switch on the “Keep Zambia Clean, Green and Healthy”.Cleanliness should be part of the business and in your blood.Have ever you wondered why you never forget to flash your toilet immediately after disposing your matuv!? The answer is simple its in your DNA after your mother taught you how to flash immediately after use .Give it say three months and boom it will be in our blood not to liter anyhow. well said, but what about that SDA exception point he has raised here. @******* pako, you are right in a long time. I can change for you…..given a chance. What sikamba is saying is what we are saying…..people will just stay home untill 11.00 hrs, they already pay bussiness rates……if a cleaning regime and system with a budget is in place , citizens will participate . I think comrade Sinkamba has raised important points which requires consideration. I would suggest that Authorities should be objective and analyze the program. For example late president Mwanawasa introduced the keep Zambia clean campaign, but because the program had no structure it failed lamentably. During the week we throw our rubbish anyhow and then we are asked to pick it up the end of the week. Does it make sense? 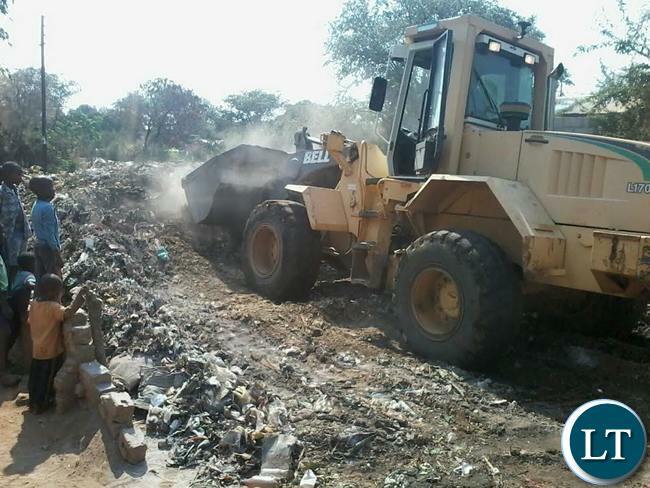 Let the government put in place effective waste recycling and disposal.